It was also great to meet so many IAFP vendors. 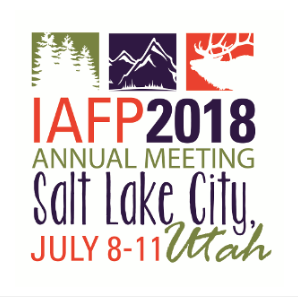 Hundreds of IAFP vendors are seeking to deliver products and/or services to improve food safety. It is an honor to share information from some who apparently are leaders in their class. The following a few of the IAFP vendors that stood out in my search for the ‘best in class’. Eurofins US Food Testing Division consists of a network of commercial testing laboratories strategically located throughout the United States. What impressed me was the purported expertise in testing for virtually anything in our food. While theirs is more of a commercial application, it is heart- warming to know this type of testing is available and should be universally used. Weber Scientific has made the testing for allergens, bacteria, chemicals, etc. in our foods convenient and inexpensive. Restauranteurs are unlikely to use some of these products except in case of questionable contamination. But health department inspectors may find these rapid tests useful for a quick determination of potential cause of food borne illness. What started out as a casual scientific conversation about ozone led to an ‘a ha’ moment. There is an increasing interest and utility in using ozone for bacteriological kill. Guardian Manufacturing, according to the VP of Sales and Marketing, offers one of the few products that scrubs ozone from the treatment environment. As a toxicologist, I can attest that production ozone carries a risk of chronic respiratory disease. Scrubbing the air is critical to preventing injury to workers. Rees Scientific offers continuous automated monitoring to a limitless number of applications in a wide range of industries. They apparently are the” leader in engineered and wired monitoring”. Their use of WIFI and the iCloud strives to become the industry standard. I had the pleasure of sharing lunch with the Sysco Corporate QA Department Manager and his spouse. It was fascinating to learn of the challenges that exist in delivery of restaurant products to end user. Since Sysco is the “Global leader in selling, marketing and distributing food and non-food products …. Around the World”, their experience can teach us all. Finally, I again had the opportunity to visit with the President of Eagle Protect and meet their science consultant, Barry Michaels PHD. Visiting the ThemoWorks booth, I was introduced to the newest products from their Product Manager. The automatic handwashing demonstration by Meritech continually impresses me. In my meeting with the President of BluLine Solutions, we had an opportunity to discuss some exciting opportunities to share intriguing research from their WIFI enabled temperature data loggers. All in all, attending the IAFP vendors area was really rewarding and educational.